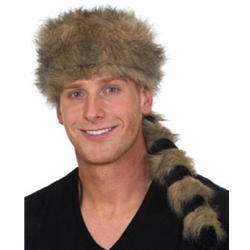 The Coonskin Hat is available in One Size Fits Most Adults. Coonskin hats were originally a Native American article of clothing, and later went on to become part of the iconic style of frontiersmen such as Daniel Boone and Davy Crockett. In the 1950s, coonskin hats took became a popular everyday hat style among the young. Pair this hat with a Davy Crockett costume and a Frontier Rifle to complete the look of an American explorer!